When the villagers saw Golem beside the tower, they tried to have conversations with him. But no matter what they said to him, all he would say in return was, "Hello, friends." 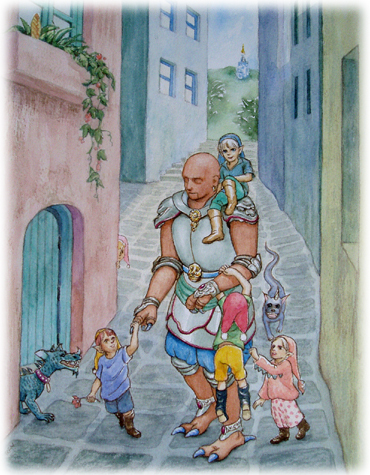 However, when the children invited Golem to come play with them, he did so gladly. Their strange companion followed them from one place to another all day long, and learned to mimic their words and gestures. When the sun set and the children had to say goodbye ("Time to go home, Big Doll! "), he waved to them and returned to the tower. The next day, Golem summoned all the chiefs to the tower. "I have three important things to ask you," he said. "First, may we stay in this world?" "We have no objections so far," said the chiefs. "Second, I have brought with me the seeds of the creatures who created me. May I release them so they can grow here?" The chiefs thought carefully. Golem seemed harmless, but the chiefs knew nothing about the creatures who had created him and sent him to their world. "These creatures," a chief asked, "Would we like them? And if our gluttonous Trolls and Goblins ate any of them, would it give them stomach trouble?" "I do not think you would have anything to fear from my creators," Golem said. "but I do not know how agreeable your Trolls and Goblins would find them." "Then we must say no," the chiefs replied. "All right, I will not release the seeds. My third question is, may I be of your assistance?" The chiefs replied, "Yes, you may." 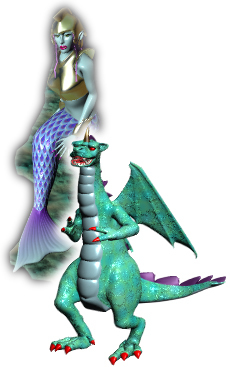 Mermaid and Wyburn in the playfield. Wyburn is the guard of the Fairy Tower Ramp. You must make him say yes to get the ball on the ramp. 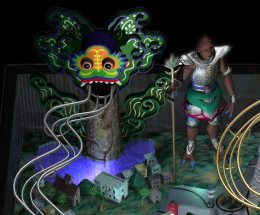 The image on the left is a part of the playfield. The big tree which has a face like Baron of Indonesia is called "ENT". ENT is the guardian of the forest. Beside the lake, you can see the Dwarf Town. The gold ramp at the right is Fairy Tower Ramp.